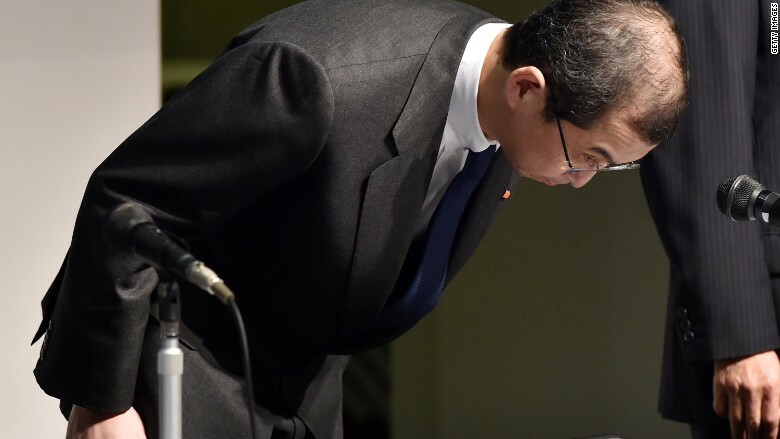 Takata chairman and president Shigehisa Takata bows Thursday in front of the media as he apologized for deaths tied to the defective airbags. Takata's chief executive has finally broken his silence, speaking publicly for the first time about the airbag scandal engulfing the company. During a rare news conference Thursday, Shigehisa Takada apologized for the deaths and injuries caused by Takata (TKTDY)'s exploding airbags, and for failing to explain the situation directly to the public sooner. The third-generation head of Takata was speaking after the company's annual shareholder meeting earlier in the day. That meeting was closed to the press. Airbags made by the Japanese company have been found to explode and send shrapnel into the face and body, mainly in the event of an accident. So far, authorities have linked the airbags to seven deaths in the U.S. and one in Malaysia. Takada has kept a very low public profile since the scandal erupted. Tens of millions of cars have now been recalled. In the U.S., at least 34 million cars have been affected -- or nearly one in every seven cars on the country's roads. The recall was made more complex following news that some cars that had already been fixed would need a second airbag replacement. Even as Takata was conducting its annual meeting, Toyota (TM) and Honda (HMC) were issuing fresh recalls. The automakers recalled roughly three million cars on Thursday, mostly in Europe. None of the recalled cars were sold in the U.S. Earlier this week, U.S. congressional investigators accused Takata of ignoring years of warnings over faulty airbags, and even putting crucial safety inspections on hold due to cost concerns. The report was written by Senate Commerce Committee staff for Sen. Bill Nelson of Florida.